Joe is passionate about developing creative solutions to problems, fabricating high-quality prototypes, and uncovering the emotional impact of good design. He wants the things he creates to have empathy, be it a medical device that instills comfort in its user or an educational tool that gives the student confidence. Joe draws from his passions in music, film, and visual art to understand what impacts him at his core and then try to apply some of those techniques to make disruptive and empathetic work. 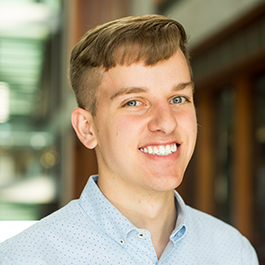 As an undergraduate at Northwestern, Joe loved the attitude about engineering design fostered by the Segal Design Institute, and he wanted to learn even more from the community that had already given him so much. He hopes to become a well-rounded designer through the EDI program by combining technical knowledge with user understanding. Joe also loves restoring old things and continuing their story. His current project is a 1970 Volkswagen Karmann Ghia named Audrey, which he bought in non-running condition. She's alive now, but still needs a lot of love to become road legal.